Definition at line 485 of file obtypes.h. Definition at line 504 of file obtypes.h. Referenced by IopParseDevice(), NtWaitForMultipleObjects(), ObpCloseHandleTableEntry(), ObpCreateHandle(), ObpCreateUnnamedHandle(), ObpDuplicateHandleCallback(), ObpLookupObjectName(), ObpReapObject(), ObpReferenceProcessObjectByHandle(), ObReferenceFileObjectForWrite(), ObReferenceObjectByHandle(), and QSI_DEF(). Definition at line 497 of file obtypes.h. Referenced by NtQueryObject(), ObDeleteCapturedInsertInfo(), ObInsertObject(), ObOpenObjectByName(), ObpDecrementHandleCount(), ObpDeleteNameCheck(), ObpIncrementHandleCount(), ObpIncrementUnnamedHandleCount(), and ObpSetPermanentObject(). Definition at line 490 of file obtypes.h. Referenced by NtQueryObject(), ObDuplicateObject(), ObpCloseHandleTableEntry(), ObpCreateHandle(), ObpCreateUnnamedHandle(), ObpDecrementHandleCount(), ObpDeleteNameCheck(), ObpIncrementHandleCount(), and ObpIncrementUnnamedHandleCount(). Definition at line 495 of file obtypes.h. Definition at line 494 of file obtypes.h. Definition at line 491 of file obtypes.h. Definition at line 500 of file obtypes.h. Referenced by ObDeleteCapturedInsertInfo(), ObInsertObject(), and ObOpenObjectByName(). Definition at line 487 of file obtypes.h. Referenced by IopParseDevice(), NtQueryObject(), NtWaitForMultipleObjects(), ObDuplicateObject(), ObInsertObject(), ObpCloseHandleTableEntry(), ObpCreateHandle(), ObpCreateUnnamedHandle(), ObpDecrementHandleCount(), ObpDuplicateHandleCallback(), ObpIncrementHandleCount(), ObpIncrementUnnamedHandleCount(), ObpLookupObjectName(), ObpReferenceProcessObjectByHandle(), ObReferenceFileObjectForWrite(), ObReferenceObjectByHandle(), and ObReferenceObjectSafe(). Definition at line 501 of file obtypes.h. Definition at line 496 of file obtypes.h. Definition at line 503 of file obtypes.h. Referenced by NtQueryObject(), and ObAssignObjectSecurityDescriptor(). Definition at line 493 of file obtypes.h. 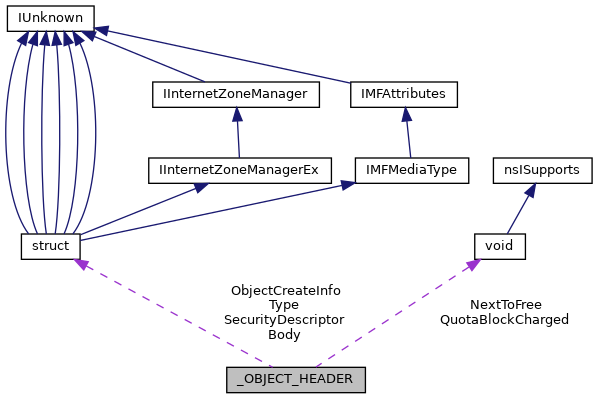 Referenced by IopParseDevice(), NtQueryDirectoryObject(), NtQueryObject(), NtUserGetObjectInformation(), NtWaitForMultipleObjects(), ObCheckCreateObjectAccess(), ObCheckObjectAccess(), ObDuplicateObject(), ObInsertObject(), ObOpenObjectByName(), ObpCheckObjectReference(), ObpCheckTraverseAccess(), ObpCloseHandleTableEntry(), ObpCreateHandle(), ObpCreateUnnamedHandle(), ObpDeleteNameCheck(), ObpEnumFindHandleProcedure(), ObpIncrementHandleCount(), ObpIncrementUnnamedHandleCount(), ObpLookupObjectName(), ObpSetHandleAttributes(), ObQueryNameString(), ObReferenceObjectByHandle(), and QSI_DEF().